Laser hair reduction is a way to reduce unwanted facial and body hair. The procedure uses laser energy to target hair follicles, damaging them so that current hair falls out and additional hair cannot grow in its place. Laser hair reduction can treat any area of the body, including the face, armpits, back, legs and bikini line. Laser energy can be adjusted to customize treatment for sensitive areas like the upper lip and bikini line or larger surface areas like the back or legs. 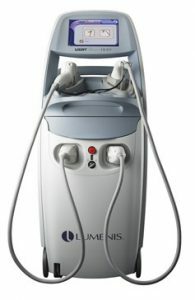 It is the most advanced laser hair reduction device on the market today. It allows for faster treatments which saves time for our patients. The treatments are virtually pain free. Most patients complete treatment within 5-6 sessions and come back for a yearly touch up after that time. Laser hair reduction tends to be most effective on patients with fair skin and dark hair, since the laser energy specifically targets the melanin in the hair shaft. However, different types of lasers can be used on other skin types and hair colors. Laser hair reduction is not effective on patients with white, grey, red or very blonde hair, since there is little or no melanin for the laser to detect. Dr. Leber’s team of certified laser technicians perform laser hair reduction at the Leber Skin and Laser Center. Patients are given special eyewear to protect their eyes from the laser light. A topical anesthetic might also be used to enhance patient comfort during the procedure. The procedure is performed using a handheld device that delivers laser energy to the hair follicles below the skin’s surface. The heat from the laser damages the follicle so it is no longer able to grow hair. The hair currently in the follicle eventually falls out and it is unlikely more hair will grow in its place. Results of laser hair reduction are usually seen within 1-2 weeks after treatment. Because the procedure only affects hair in the active growth phase, repeat sessions are generally needed to ensure all of the follicles in an area are treated. While some patients find laser hair reduction is a solution to unwanted body hair, some may need touch-up treatments every 12 months or so to maintain results. Laser hair reduction is a safe, effective way to remove unwanted hair from any area of the body.